Liam is a new author to me, he asked me if I would like to review his book, of course I said yes. Don't you just love reading new authors, mainly they are taking you on different journey to one that you are used to, and sometimes its refreshing to read a new author. This was a great book to read, and I can thoroughly recommend it. 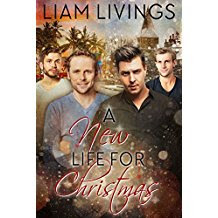 For me Liam caught the magic of Christmas with also the just right amount sexual tension, you knew what was going to happen without being told and it was lovely to read. They was also some what I call chuckle moments, which lifted the book. I cannot express how I much I loved reading this book. All I can say is I will definitely be reading a lot more of Liam's books. I will give this book 5/5 stars and this book is available to buy from Amazon. I received this ARC copy from the author, in return for a honest review.